You can adjust the multimedia system to your desired settings. Press the “SETUP” button to display the “Setup” screen. 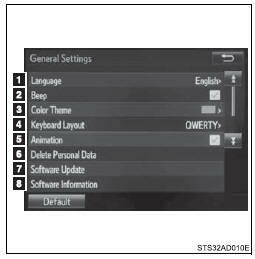 Select to adjust the settings for operation sounds, screen animation, etc. 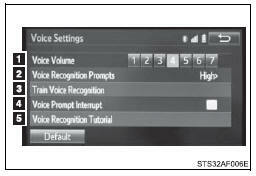 Select to set the voice settings. Select to adjust the settings for contrast and brightness of the screen. Select to adjust the settings for registering, removing, connecting and disconnecting Bluetooth® devices. Select to adjust the settings for phone sound, contact, etc. Select to set audio settings. Select to turn the screen off. 1. “English”, “Français” or “Español” can be selected. 2. On/off can be selected to sound beeps. 3. Select to change the screen color. 4. Select to change the keyboard layout. 5. The animation effect for the screen can be set to on/off. 7. Select to update program versions. For details, contact your Toyota dealer. Select “Delete Personal Data” on the “General Settings” screen. A confirmation screen will be displayed. Select “Yes”. Select “Audio” on the “Setup” screen. Select the number of radio preset stations. Select “High”, “Middle”, “Low” or “Off”. Select “Display” on the “Setup” screen. Select “General” or “Camera” on the “Display Settings” screen. Adjust the display as desired by selecting “+” or “-”. However, the screen can be switched to day mode by selecting “Day Mode”. The screen will stay in day mode when the headlights are turned on until “Day Mode” is selected again. Set the voice recognition prompts “High”, “Low” or “Off”.